Diocletian's Palace in Aspalathos. His tomb wis later turned intae a Christian kirk, the Cathedral o St. Domnius, which is still staundin within the palace at Split. 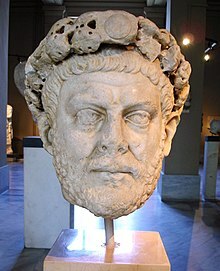 Diocletian /ˌdaɪ.əˈkliːʃən/ (Laitin: Gaius Aurelius Valerius Diocletianus Augustus), born Diocles, (245–311) wis a Roman emperor frae 284 tae 305. ↑ 3.0 3.1 Barnes, "Lactantius and Constantine", 32–35; Barnes, New Empire, 31–32.